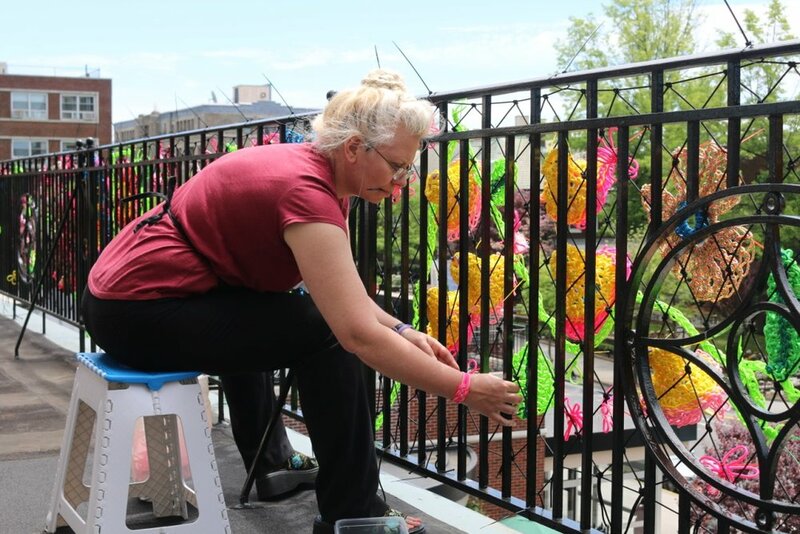 This artwork features hundreds of colorful flowers – knitted, knotted, macramé and crocheted – that adorn the terraces. The installation reflects the artist’s interpretation of a variety of flowers – roses, tulips, calla lilies and many others. Collaborating with members of the Boston Secor Senior Center, Su Casa Program and the Bronx Council on the Arts, Marshall has created a restorative environment in a healthcare setting. The installation creates a fun and colorful environment that promotes green spaces, nature, and health for Montefiore patients, families, staff, and the surrounding community of the Bronx. Marshall is a contemporary textile-knit artist living and working in the Bronx who is renowned for her unique knitted imagery of nature. For The Hanging Garden, she worked with over 28,000 square feet of Paracord, an all-weather, durable material used for outdoor activities. Most interesting, two of the color patterned cords represent breast cancer awareness and autism awareness. This assemblage of wonderful blooms and blossoms spans 80 feet in width and has transformed the terraces of the Montefiore Moses Campus.